Since his debut in the 80’s, Nintendo’s famous plumber has spawned a plethora of games, touching upon nearly every genre and delivering smiles to people all over the world. Shigeru Miyamoto’s excellence in game design and character creation is one that’s been seminal and is responsible for copious amounts of developers’ paths to where they are today. Until Super Mario 64, most mainline Super Mario games had been side-scrolling platformers. With its addictive gameplay and unique design, Mario went on to become one of the gaming world’s most unique and well known characters in gaming history. Mario has become an iconic character known globally even to those unfamiliar with the medium. With countless ROM hacks for the various Super Mario titles from the original to 3 to World plaguing the internet for years, now you can design your own Mario levels seamlessly with the Wii U GamePad easily, and the possibilities are endless. 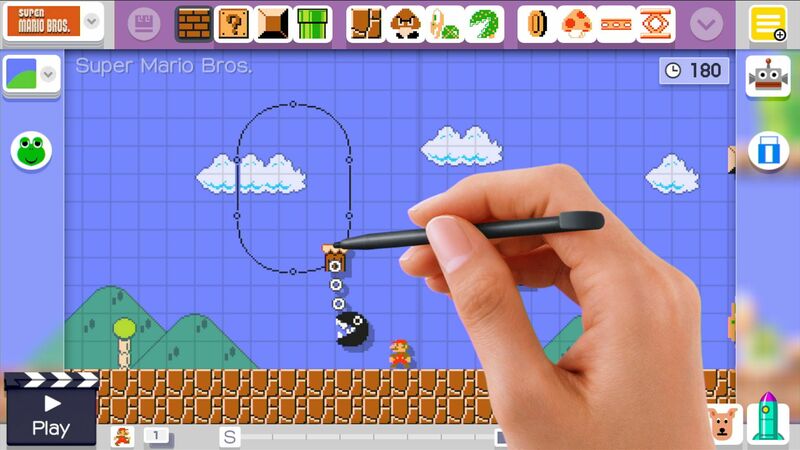 Super Mario Maker allows you to bring out your inner game designer. The GamePad makes excellent use of crafting levels that you can imagine by seamlessly selecting and dragging wherever you’d like on whichever Super Mario title you’ve selected. Once you start the game, you’re taken through a tutorial to get you familiar with the different mechanics, how some items have variants by shaking them, how to go about extending a course, copying, dragging, so on and so forth. Though you’re given a good amount of tools to start out with, the game doesn’t give you everything off the bat, requiring you to play up to nine days – at least five minutes a day – in order to be queued for the next delivery the following day when you boot up Super Mario Maker. To some, this may feel a bit disheartening not being able to unleash a wave of pent up creativity. To others, it might have a satisfying feel being able to take this massive game step by step. Regardless of your preference, this aspect allows you to become familiar with the title on a personal level. It forces you to become more imaginative and use all of your tools at hand in order to create your ideal course. There are countless courses to play through, both preset and user-created, that utilize this small amount of tools and even excel at it. I played many courses both online and locally that were created (both preset and user-created) that were quite intricate with the limited tools given. When you start up the game, you have the option to choose between the original Super Mario Bros. style or the more modern New Super Mario Bros. Switching between each generation of Mario is seamless and everything you create will transfer without issue into the next. 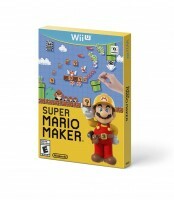 Over time, you will unlock Super Mario World and Super Mario Bros. 3 to play through as well. For those who have played Mario since the beginning, you may have noticed that each particular title has a different set of physics when it comes to the way Mario runs, jumps and how enemies react – not to mention some extra abilities Mario is capable of like his spin hop in Super Mario World. The way the game originally played in each entry of Super Mario carries over into Super Mario Maker. It’s the game as you remembered it. However, this time around, the levels are yours and those of other fans. What’s so great about Super Mario Maker is that the game is virtually endless when it comes to delivering content. For those who may feel as if their creative bone hasn’t grown enough, there’s the 10 Mario Challenge, which has you going through eight preset levels with a maximum of 10 lives in typical Mario fashion, one level at a time – circle to circle – until you are able to reach the very end of the world at Bowser’s Castle. It is here where you fight the famous boss to save Peach before being told by Toad the line you’ve always hated hearing: the Princess is in another castle. Not all is lost, however. Each time you complete it, you’ll be awarded with a new costume which can be used for Mystery Mushrooms. This will make Mario into Costume Mario, taking the likeness of whichever character you’ve set. Alternatively, some can be unlocked via amiibo. This is especially nice for those who don’t feel the need to buy Nintendo’s figures or happen to not have certain characters due to rarity. These costumes can still be easily obtained normally by simply playing the game. I found these levels to be incredibly fun and varying in difficulty, spanning across different generations of Mario to appease both old and new fans alike. Going over to the online (and near endless) portion of Mario Maker is extremely easy. 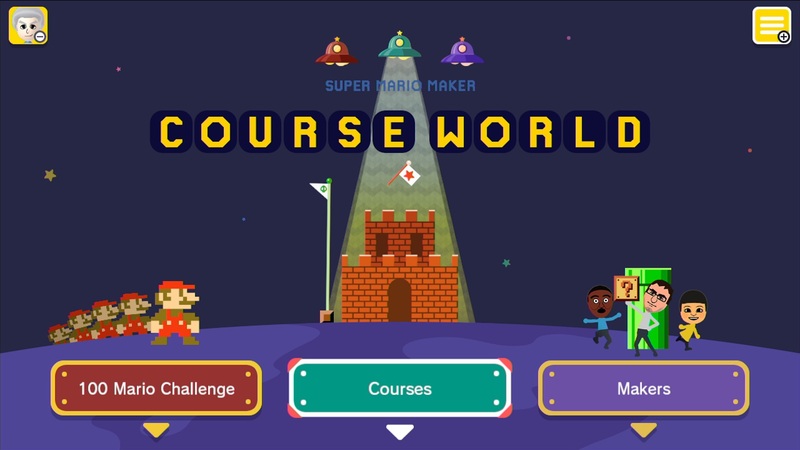 By hitting the ‘+’ button on the GamePad, a menu opens up giving you the option to go to Course World. This is where you’ll experience user created levels which you can choose individually, rate, and even comment on. For those who are not quite up to the task of choosing a course to go through, there’s the 100 Mario Challenge. 100 Mario Challenge chooses random levels depending on which difficulty you have chosen. You are given 100 lives to complete either eight or sixteen levels. These are often chosen from user-created courses. 100 Mario Challenge is extremely fun for those looking for a challenge comprised of unique levels made by other players. It’s a great way to see all sorts of courses, from very popular ones to some of the lesser known levels. If you head over to the “most recent” tab you’re able to view courses as they are created and submitted. This is a great way to see the smaller courses compared to the “featured” tab which allows you to see the most popular and challenging levels. The greatest part about the online experience is the fluidity of the user-interface as well as having no lag whatsoever. Not once did I experience an issue finding, loading, or playing courses. Everything played out as if it was done locally. Miiverse integration allows players to comment on user-created levels and deliver feedback on courses. You’ll get notifications whenever these things happen in real-time. If comments are submitted while you are offline, you’ll be notified the next time you boot up the game. It’s really nice to see what people have to say about your courses. I ran into a few comments on some courses I created where people absolutely loved it, which was really reassuring. It makes you want to create more, and the support you give others will only further the great community and creativity of players even further. One fear I’m sure many will have is the idea of “troll” levels, but this is easily countered. The only way you can submit your level is if you can beat it yourself. If you can’t achieve that goal, then it is not allowed to be uploaded. Super Mario Maker gives the player a look into the past. It gives the fans a chance to relive some of the history of what made Mario so great. This time around, you’re able to make the courses yourself. Being someone who’s played Super Mario since the original NES version and every iteration following, it can be an absolute joy to be able to create your own levels and designing Mario however you’d like. It’s even more enjoyable making your courses, handing them off to your friends to see if they can complete them, and vice versa, both locally and online. Mario fans, artists, and everyone in between are sure to enjoy this incredible amalgam of Mario titles where you’re the one in control. Designing your own levels and worlds really does make this an endlessly fun experience for all to appreciate. 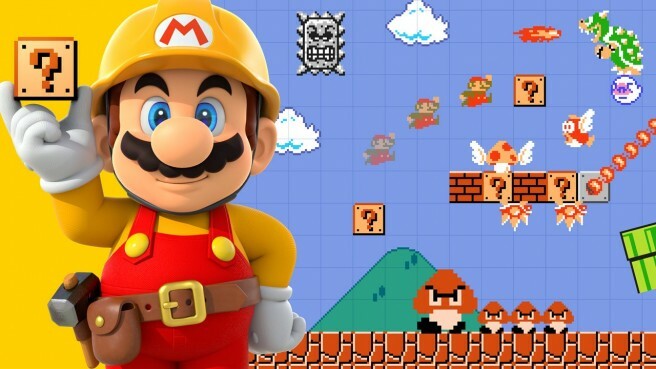 For those who love Mario and love to create, Super Mario Maker delivers an endless wave of Mario levels both preset and user created. Its online sharing feature brings together one of the most fun and unique Mario experiences for aspiring designers and Mario enthusiasts alike. Those who have grown up with Super Mario Bros., World, 3, and beyond will feel both nostalgic and revitalized as the levels have never felt more unique and alive as they do now. If you can think it, you can make it. The only true issue with Super Mario Maker is the fact that the poor battery life of the GamePad causes you to cut your play sessions a little early. 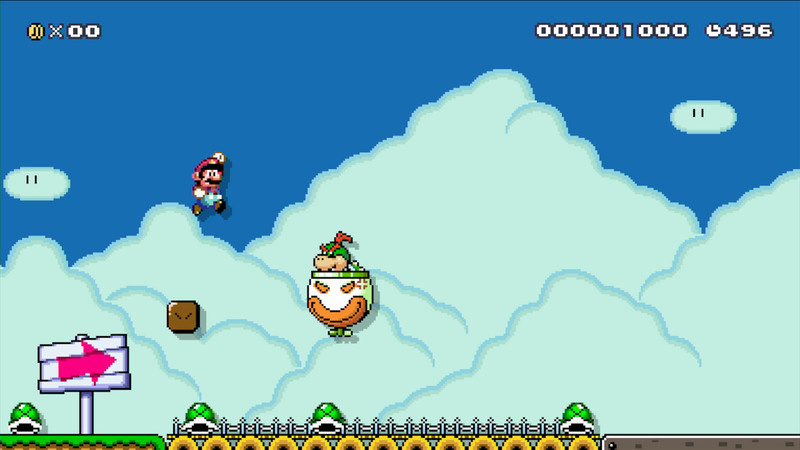 Super Mario Maker is incredibly fun and addictive. It’s easy to find yourself clocking in well over 20 hours of play-time within the first three days. Fans of Mario need to look no further: this is the infinite Mario experience you’ve been looking for. Whether you want to create, play, or both, Super Mario Maker can now be seen as the official hub for all things side-scrolling Mario.